The largest type of bearing block *masu 斗, usually placed directly on top of a pillar. It is also found on top of a bottle strut *taiheizuka 大瓶束, directly on a beam *keta 桁 on a wall plate *daiwa 台輪, or on a plate-like base *sarato 皿斗. 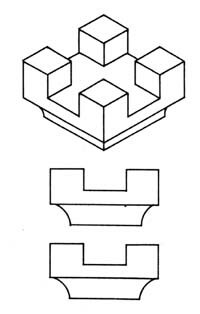 This bearing block is the foundation upon which an entire bracket complex *tokyou 斗きょう is built up and interlocked. The lower edges of the bearing block are cut away on all sides, about one third of the whole, so it they will fit within the circumference of the top of the pillar. The result is a fine curve on all four sides called toguri 斗繰.